This image, taken by ESO Photo Ambassador Petr Horálek, captures the moment that Yepun (UT4), one of the four 8.2-meter Unit Telescopes comprising ESO’s Very Large Telescope (VLT), shoots a laser beam up into the dark night sky over ESO’s Paranal Observatory in Chile. 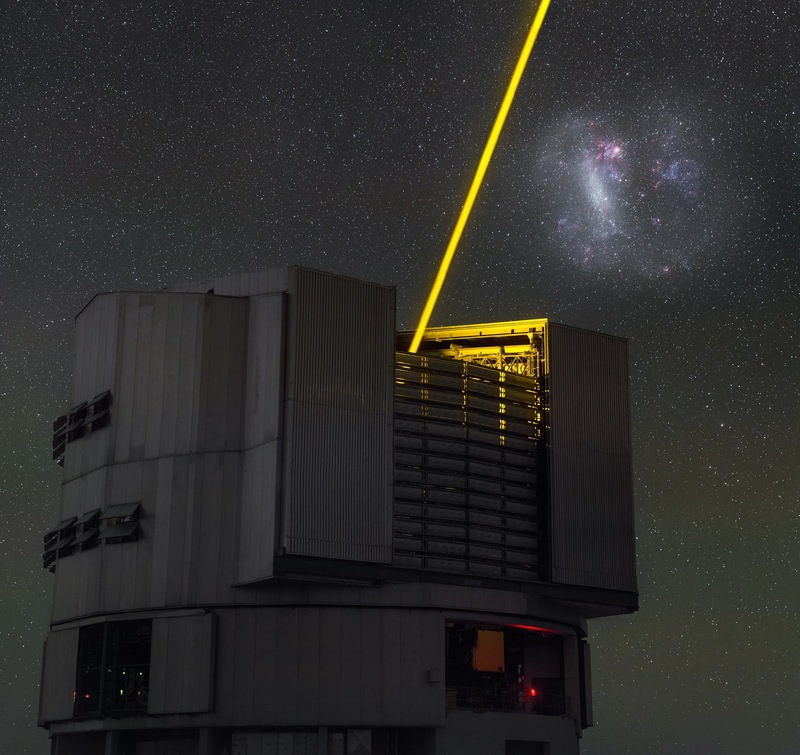 The laser shown in this image acts as an artificial star, known as a Laser Guide Star, and it is used to help astronomers adjust for the blurring and distorting effects of the Earth’s atmosphere. When observing a patch of sky, astronomers set up a laser guide star nearby and measure the tiny fluctuations in its image. The VLT’s adaptive optics system can then use this reference to correct for the changes and distortions in the intervening atmosphere and produce the sharpest images possible in the main observations. Looming over Yepun is the Large Magellanic Cloud (LMC), a barred spiral galaxy that orbits the Milky Way. A faint white glow marks the location of older stellar populations within the LMC, while the iridescent hues of magenta and blue mark young stellar nurseries. The LMC, as well as its smaller namesake, the Small Magellanic Cloud (SMC), have been studied many times by ESO telescopes over the years. Its many cosmic delights, including nebulae and star clusters, can be seen in detail due to their proximity, and provide amateur and professional astronomers alike with breathtaking targets for observation.